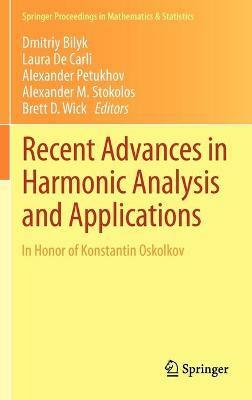 Recent Advances in Harmonic Analysis and Applications features selected contributions from the AMS conference which took place at Georgia Southern University, Statesboro in 2011 in honor of Professor Konstantin Oskolkov's 65th birthday. The contributions are based on two special sessions, namely "Harmonic Analysis and Applications" and "Sparse Data Representations and Applications." Topics covered range from Banach space geometry to classical harmonic analysis and partial differential equations. Survey and expository articles by leading experts in their corresponding fields are included, and the volume also features selected high quality papers exploring new results and trends in Muckenhoupt-Sawyer theory, orthogonal polynomials, trigonometric series, approximation theory, Bellman functions and applications in differential equations. Graduate students and researchers in analysis will be particularly interested in the articles which emphasize remarkable connections between analysis and analytic number theory. The readers will learn about recent mathematical developments and directions for future work in the unexpected and surprising interaction between abstract problems in additive number theory and experimentally discovered optical phenomena in physics. This book will be useful for number theorists, harmonic analysts, algorithmists in multi-dimensional signal processing and experts in physics and partial differential equations. Illustrations note XII, 408 p.
Recent Advances in Harmonic Analysis and Applications is dedicated to the 65th birthday of Konstantin Oskolkov and features contributions from analysts around the world. The volume contains expository articles by leading experts in their fields, as well as selected high quality research papers that explore new results and trends in classical and computational harmonic analysis, approximation theory, combinatorics, convex analysis, differential equations, functional analysis, Fourier analysis, graph theory, orthogonal polynomials, special functions, and trigonometric series. Numerous articles in the volume emphasize remarkable connections between harmonic analysis and other seemingly unrelated areas of mathematics, such as the interaction between abstract problems in additive number theory, Fourier analysis, and experimentally discovered optical phenomena in physics. Survey and research articles provide an up-to-date account of various vital directions of modern analysis and will in particular be of interest to young researchers who are just starting their career. This book will also be useful to experts in analysis, discrete mathematics, physics, signal processing, and other areas of science.